Gardeners are born optimists! To plant the seed, the seedling, the sapling is to witness to our being there to see it grow, to our certainty that it will grow. If not this time, then next time. Gardeners are always looking to the future. As the birds lay their eggs, the gardener tills his soil and plants his crops. Enjoy your visit to my garden. Hop on over and visit in DefBird's own garden. I always enjoy a visit to Weston Gardens . This is a family enterprise in my home town of Fort Worth. They are restoring an old estate garden that was allowed to deteriorate. They also have a nursery that sells native plants and a gift shop with beautiful things for the garden and the gardener. This beautiful plant is growing in their garden. I call the ones growing in my garden "Rose of Sharon" but, it has many names. 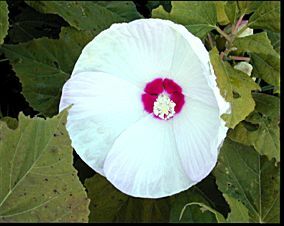 In their garden it is named Rosemallow. It is in the Hibuscus family. This lovely scene is in the gardens of Winterthur. I spent a few hours here once. 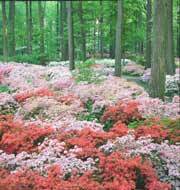 It is impossible to see all the wonderful things in these gardens in just a few hours. gardens is one of the great pleasures of traveling. Take a virtual tour. in the Royal Botanic Gardens in Sydney. They are so awe inspiring. Gardens I hope to visit sometime! This is the Palm House at the Royal Botanic Gardens, Kew. In the foreground is a Dali sculpture. Gardening may not have originated in England, but, they sure are the ones who raised it to an art form. famous English gardens and historic homes. It is one of my dreams. Here is a specimen from the Royal Botanic Gardens, Canada . winter scene on their web site, all snow and ice. Some winters, I don't even see any snow. The garden looks especially nice! There are so many seed companies. How can we ever choose? I guess that is why I just stay with what I have always used. ...and a dog to chase them! Save a place for pets in your garden and come back to visit with me in mine as often as you can. "A garden is a lovesome thing, God wot..."
If you have visited any beautiful and/or famous gardens, post to me and tell me about them. Send a URL if you have one. If I get some, I will make a section for recommended sites.